Vanity Mirror With Zoom Capability | OhGizmo! By Andrew Liszewski on 11/21/06 • Leave a comment! Now normally I wouldn’t give something like a vanity mirror a second look (and hold for laughter…) but this one from firstSTREET is actually pretty neat. Whole most mirrors simply have two sides that can easily be flipped around to switch between a normal or close-up view this one does it with a bit more tech. With the touch of a button the mirror will automatically adjust itself between magnifications of 1x to 5x just like a camera lens allowing the mirror to be customized to anyone’s needs. I assume a small set of motors or something is being used to warp the mirror itself which requires 3 AA batteries but those are also used to power 3 LED lights around the edge. 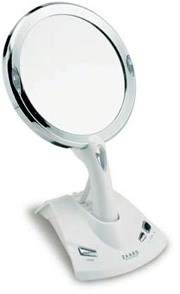 The Power Zoom Vanity Mirror is available from firstSTREET for $49.95.